Stamp with Melva: Bokeh - Have you tried this technique? I've been seeing lots of postings about cards made using a technique called Bokeh. I wasn't really sure what it was but once I saw the cards and also checked out a video to see how to do it, I decided to give it a try. It's a little messy, but not really difficult. I first mixed 3 colours - about 6 drops of reinker with about a teaspoon of water, but you can mix to your liking. 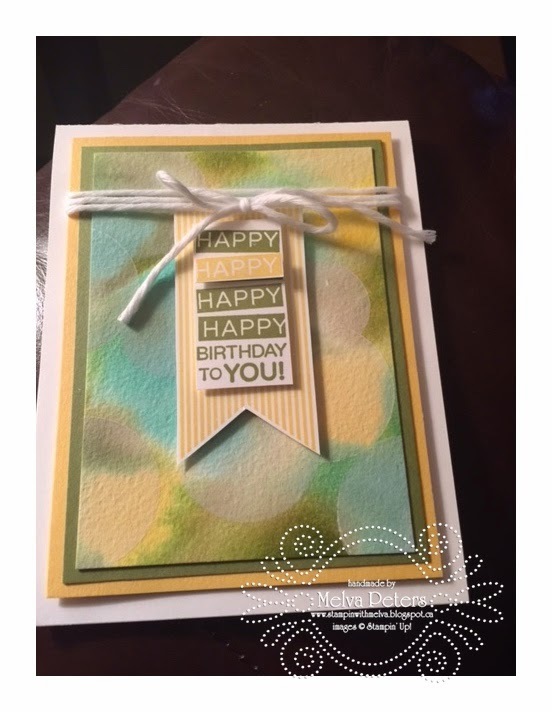 In this card I used Coastal Cabana, Old Olive and Daffodil Delight. I used watercolour paper and then wetted it with my aqua colour painter. I did find that it works a little better if the paper isn't too wet. Once you have the paper wetted, I used my Aqua Painter to randomly put spots of colour down until I had the paper full. Then I went back with my lightest colour and made sure I didn't have any white spots. Let this dry. The next step is to make a template of various circle sizes. I used my circle frailest and a window sheet. Then lay the template over top and colour in the circles using a White Kraft Ink Pad and a sponge dauber. You can overlap the white circles. Here's another tip - I found that I needed quite a bit of white kraft ink to be able to see the circles. Make sure your ink pad isn't too dry and make sure your watercolour paper is dry. Someone told me that you might be able to use White StazOn, but I haven't tried this yet. I like how this turned out. Have plans for more of these cards in the future! Interested in learning more, email me. Don't miss out on your chance to order from the Occasions Catalogue and to get free Sale-a-Bration rewards! Both end March 31st. For every $60 you spend you choose 1 free Sale-a-Bration reward. Email me me or shop online to place your order.